Tatum Werntz spells “chivalrous” correctly to earn the title of 2019 Spelling Bee champion of Sidney City Schools City Wide Spelling Bee Tuesday, Feb. 5. The bee was held at Sidney Middle School auditorium. Tatum is the daughter of TJ Werntz and Tina Woodell. She attends sixth-grade at Sidney Middle School. Tatum Werntz, left, winner, and first runner up, Keegan Conley. Tatum is the daughter of TJ Werntz and Tina Woodell. Keegan is the son of Matt and Dana Conley. Keegan attends Emerson Elementry and is in the sixth-grade. 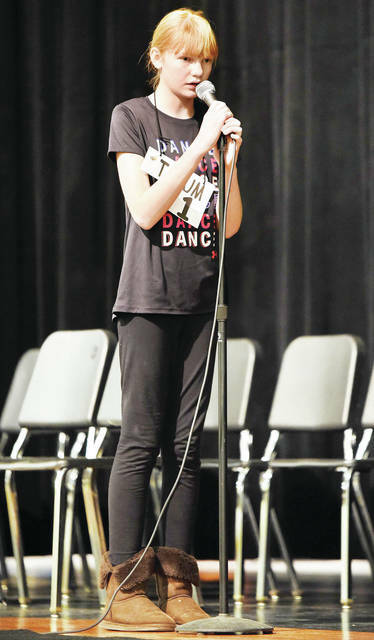 SIDNEY — A Sidney Middle School sixth-grader was crowned the Sidney Citywide Spelling Bee champion Tuesday night, Feb. 5. The bee was held in the Sidney Middle School auditeria. 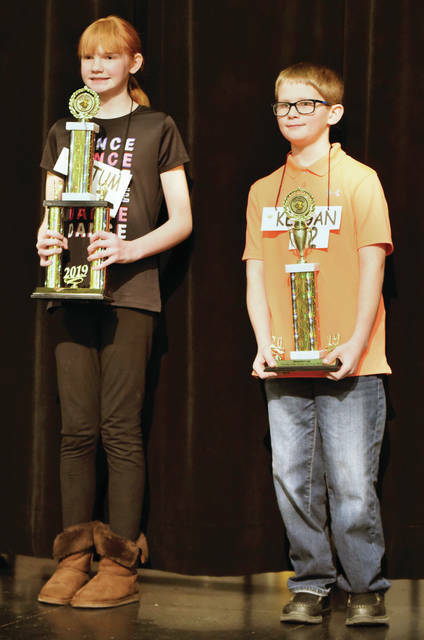 The bee lasted 20 rounds and ended when Tatum Werntz, a sixth-grade student from Sidney Middle School, correctly spelled the word “chivalrous.” Keegan Conley, a fifth-grade student at Sidney Middle School, was the first runner-up. Ryan Fitchpatrick, a seventh-grade student at Holy Angels School, was the second runner-up. Thirteen spellers from Christian Academy Schools, Emerson Elementary, Holy Angels School, Longfellow Elementary, Northwood Elementary, Sidney Middle School, and Whittier Elementary competed for the Sidney Spelling Bee championship title. • Michael Locker III, fifth-grade, Whittier Elementary, son of Michael and Jessica Locker, Jr. The following students qualified for the city-wide bee but were unable to attend: Breanna Colburn, sixth-grade, Christian Academy, daughter of Ella Colburn; Pratisth Agarwal, fifth-grade, Emerson Elementary, son of Krishna and Neha Agarwal; and Owen Deam, seventh-grade, Sidney Middle School, son of Dave and Katie Deam. Mandi Croft, Sidney City Schools Board of Education member, pronounced the words. Judging the contest were Bob Humble, Sidney City Schools superintendent, Anne Geise, Sidney Middle School counselor, and Jenny VanMatre, retired Sidney City Schools teacher. Brooke Gessler, curriculum director for Sidney City Schools, is the District Spelling Bee coordinator. All winners from each school will go on to represent their school at the Lima News Regional Bee. The regional bee will be held at Rhodes College in Lima, Ohio. Should the winner not be able to compete, the first runner-up will compete in their place.